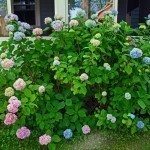 I have two climbing Hydrangeas on two different fences planted almost side by side. One of these bloom very well every year, while the other one has never had even one bloom on it in three years. 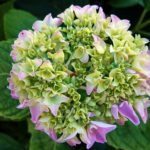 The one that blooms resembles a lace-cap hydrangea in appearance and is quite lovely. I have no idea why the one plant simply will not bloom at all. Both plants receive the the exact amount of light and water since they are both planted in the same location.